The Summer of Zuck is upon us. Here's Mark "Secret Wedding" Zuckerberg with his new bride, Priscilla Chan. Their honeymoon was great! They ate McDonalds, failed to use an ATM, and took pictures of... something. 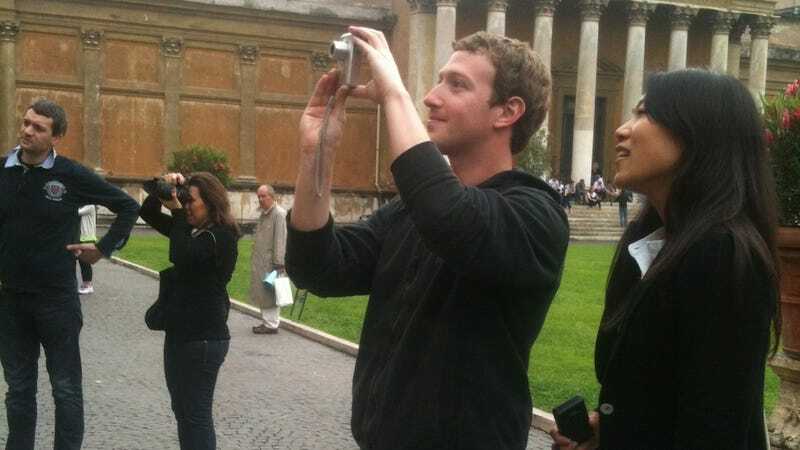 This is a photo of Mark and his new wife on their honeymoon in Rome. We were at Vatican City at the Vatican Museum on our way to the Sistine Chapel and St. Peter's Basilica. In this photo, he is taking a photo of another tourist who didn't recognize him at all. Funny story, she asked him if he could take a picture of her and he said "of you?" He completely thought that she wanted a picture with him. Little did she know that she just talked to a $20 billion man. Remember, put on your sunscreen, unzip that hoodie, and email your personal paparazzi photos to zuck@gizmodo.com.